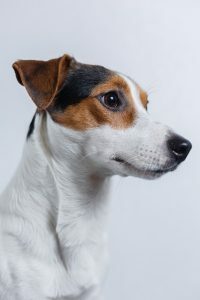 Jack Russell Terriers are a type, or strain, of working terrier; they are not purebred in the sense that they have a broad genetic make-up, a broad standard, and do not breed true to type. You will see different “types” of JRTs, from long-bodied, short, crooked legs to a more proportioned length of body and longer legs. This is a result of having been bred strictly for hunting since their beginning in the early 1800’s, and their preservation as a working breed since. The Jack Russell takes its name from the Reverend John Russell who bred one of the finest strains of terriers for working fox in Devonshire, England in the mid-to-late 1800’s. Rev. Russell (1795-1883), apart from his church activities, had a passion for fox hunting and the breeding of fox hunting dogs; he is also said to be a rather flamboyant character, probably accounting for his strain of terrier’s notability and the name of our terrier today. John Russell maintained his strain of fox terriers bred strictly for working, and the terrier we know of today as the Jack Russell is much the same as the pre-1900’s fox terrier. The Jack Russell has survived the changes that have occured in the modern-day Fox Terrier because it has been preserved by working terrier enthusiasts in England for more than 100 years. It is the foremost goal of the JRTCA that the Jack Russell continues in that tradition. The Jack Russell is a happy, bold, energetic dog; they are extremely loyal, intelligent, and assertive. Their greatest attribute is their working ability, closely followed by their excellent qualities as a companion. Unlike some modern breeds, Jack Russells have one type, hunting. Hunting ability is bred into them. It is their nature. The unique personality of this feisty terrier is rapidly gaining popularity, but they are not a dog for everyone, especially first time dog owners. While adaptable to a variety of environments, they are first and foremost bred to hunt. These dogs come in three different coat types; smooth (recessive), broken (intermediate), and rough (coarse, longer straight hair, dominant over smooth). All coats shed, smooth coats shed the most. They are adaptable to most climates and usually handle the cold fine, although some dogs will need a dog blanket or sweater if under 40 deg. Fahrenheit. The color of the coat must be at least 51% white, or all white. Black and/or tan markings are allowed. Height can be between 10″ and 15″, with a proportionate body length. For showing purposes, terriers are classified in two groups, 10″ to 12 1/2″, and over 12 1/2″ and up to 15″. Dogs should appear compact and balanced, always in solid, hard condition. Jack Russells have a short, upright tail, about 4″ long. The tail is cropped shortly after birth, and front dewclaws are removed. What famous Jack Russell Terriers would I recognize? “Eddie” on the television show Frasier. He is a rough coat. “Milo” from the movie “The Mask” is a smooth coat. The puppy in the RCA commercial. “Barkley” from the movie “Clean Slate” with Dana Carvey. More recent has been a terrier in an MCI commercial. Also, the Nissan commercial has a JRT in it, and there is a pizza commercial where a JRT and a shaggy dog lick sauce off a giggling child’s face. The PBS show “Wishbone” features the JRT Wishbone. How much should I expect to pay for a Jack Russell Terrier? Most breeders are charging anywhere from $350.00 to $600.00 for a puppy. Don’t forget all the other costs involved with owning a dog — vaccinations, neutering/spaying, food, toys, crate, home improvements (better fencing), books, obedience classes (a must! ), etc. You might be able to adopt a Jack Russell from Russell Rescue for a lower up-front purchase price. Are Jack Russell Terriers really as energetic as they seem? Jack Russell Terriers are very energetic dogs, with a big need for regular exercise. They are working dogs, and need to have a job, whether it be keeping your yard free of rodents (digging is normal and common since they are bred to dig after quarry), chasing a ball, or going for a run or long walk with its owner. Sitting on the couch peacefully all day is not in a Jack Russell’s agenda. They require more of a time commitment than some breeds. Because they are small, they seem ideal for living in an apartment. Will a Jack Russell be happy in an apartment situation? Given the exercise requirements of the Jack Russell, a home with a large, fenced yard is more appropriate. They do not take well to inactive, sedentary lifestyles. However, if you are at home during the day or are able to provide regular exercise, it may work. They need a 5-6 foot high fence since they are known to jump, climb, and even dig under fences. Many of the Jack Russells in the Rescue are there because the owner underestimated the attention requirements of the terrier. Author’s note: I work 8 hours a day, and my JRT is home alone for this time. She does fine in a small dog-proofed room and doesn’t seem unhappy about her situation. Will a Jack Russell Terrier cohabitate with my cat/small pet/young child/horse? Cats and other small pets (rodents) will usually not work with a Jack Russell because these dogs are first and foremost hunting dogs. They see the cat or hamster/rat/guinea pig as prey (quarry). This is not true for all Jack Russells, and if brought into the household as a pup, most could be trained to live with a cat. Many Jack Russell owners are horse people. Jack Russells are not herding dogs, so the horse isn’t of interest to them. Children under the age of six can be a problem unless the child is taught how to properly handle the terrier. Having the natural assertive terrier characteristics, however, the Jack Russell will not put up with even unintended abusive behavior from a child. This should be carefully considered, particularly with children under six. Are Jack Russell Terriers dog aggressive? They can be very aggressive with other dogs (not just other terriers), and in certain cases, more than two terriers shouldn’t be kept together unattended. It is very important that prospective Jack Russell owners understand this sometimes harsh part of the terrier’s nature. Can I train the hunting instinct out of my Jack Russell? To be blunt, perhaps you should consider a different breed if you don’t wish to have a hunting dog. Jack Russell Terriers can be difficult to deal with because they are true hunting dogs. They should be kept on a leash when in rural/country areas because if they take off after a ground squirrel or other quarry, they will not hesitate to dig and go underground. Terriers have been known to stay underground with their quarry for days, with no food or water. Despite the fact that the JRTCA will not register any dogs until they are one year old and have passed a structured veterinary examination, hereditary defects do occur in the breed. Some occur because they are late onset, others, because the genetic nature is recessive or polygenic which, means the parents may be perfectly normal upon examination and yet produce affected litters. According to the Canine Eye Registration Foundation, JRTs are afflicted with lens luxation. This is a displacement of the lens from its normal site behind the pupil and may result in elevated intraocular pressure (glaucoma) causing vision impairment or blindness. Lens luxation not associated with trauma or inflammation is presumed to be inherited. Legg-Perthes Disease also affects this breed, as it does many small breeds. It is very similar to hip dysplasia, however, instead of the acetabulum being shallow, necrosis is of the femoral head. This disease may be a simple autosomal recessive or polygenic (more than one gene involved) and results in painful hips. While those are the two most common diseases, the breed can also be afflicted with epilepsy, skin conditions (including allergies), and genetic deafness. The latter is associated with white coats: Dalmatians and some other white dogs have the same problem. A BAER test is necessary to rule out the condition. One may know that a dog can hear, but only the BAER test can prove whether the hearing is in both or only one ear. The JRTCA recently sent out a Genetics Disorder Survey (January 1997) to all members who have a registered kennel prefix. Its purpose is to help determine genetic problems and frequency of occurrence in the breed. The results will be published in True Grit, the club newsletter. As in all breeds, there are good and poor breeders. Purchase a pup from someone who has completed BAER tests, eye examinations and hip evaluations on their breeding stock. This will improve your chances of a healthy pup. The Jack Russell Terrier Club of America (JRTCA) breed registry is one of the most unique registries in the world. It has been designed specifically to maintain the the Jack Russell Terrier as a healthy working breed, free from genetic faults and characteristics that would be detrimental to the breed. Unlike other registries which register entire litters at birth, each application for registration in the JRTCA is judged on the individual terrier’s own merits; having registered parents does not automatically guarantee that a terrier can be registered. Veterinary Certificate. A JCTRA Veterinary Certificate, designed specifically for the Jack Russell Terrier, must be completed and signed by a liscensed veterinarian stating that he has examined the terrier and found it to be free from inherited defects. Pedigree. A complete pedigree, signed by the breeder (4 generations are required as of July 1, 1993). The JRTCA will not accept any terrier that is inbred according to the JRTCA’s inbreeding policy. Stud Service Certificate. A stud certificate signed by the owner of the sire, verifying that they bred their stud dog to the dam of the terrier applying for registration. Color Photographs. Clear photos, standing on a firm surface, clearly showing each side and the front of the terrier, are required in order to evaluate the terrier’s general adherence to the breed standard. The JRTCA and the JRT Club of Great Britain (JRTCGB), along with the majority of the JR Clubs in the world, strongly oppose recognition of the Jack Russell by any kennel club/national all-breed registry. Most JRT owners, and all working terrier people, seem to be in complete agreement on this issue. The highest compliments the JRTCA receives comes from its registry. Those familiar with kennel club registries would say that they are proud to be associated with a registry that turns down dogs with genetic faults. Kennel club registries accept anything, and thus implicitly condone breeding from it. By turning down dogs with inherited defects, the JRTCA is doing a great service to protect the Jack Russell and keep out serious faults in the breed. The UKC accepted the Jack Russell Terrier for registration in 1992, against the advice of the JRTCA. The JRTCA views this as a clear and present danger to its efforts of preserving and protecting the Jack Russell Terrier, and in no way endorses recognition of the Jack Russell Terrier by the UKC or any other all-breed registry. All Jack Russell Terrier owners are asked to support the JRTCA in its efforts to protect and preserve the Jack Russell Terrier as we know it today, and not to support the UKC registration of Jack Russell Terriers. The JRTCA fully expects that in the future they will have to face further challenges as the Jack Russell Terrier becomes more and more popular, and trust that the JRTCA members, and all Jack Russell enthusiasts, will be equal to the task. The Parson JRT Club in England actively campaigned for and acquired British Kennel Club recognition for a terrier meeting a narrow portion of the JRT breed standard. This small group has only been in existence a few years and has formed their own standard including only a specific size and type which they claim was preferred by Rev. Parson himself. The BKC accepted the proposal, however, the JRTCA and JRTCGB will refuse membership to anyone belonging to The Parson JRT Club, the Jack Russell Terrier Breeder’s Assoc., or who have JRT’s registered with the BKC or the UKC. In the fall of 1996, the AKC accepted the JRT in its new Foundation Stock Registry. Dogs registered here cannot compete in AKC events. AKC officials state that this type of registry is a holding area for breeds so that they can obtain the numbers, registrations and statistics necessary to become fully recognized. The recognition process could take anywhere from two to twenty years but it has begun. Traditionally, the Jack Russell Terrier trial is made up of three divisions: conformation, go-to-ground, and racing. Obedience, agility, and search ‘n’ sniff are also being included more often in these events. Conformation classes are judged much like any other dog show. The winner is the dog that most closely matches the breed standard. In addition to conformation and movement, the dog is judged on temperment; as in all things having to do with Jack Russells, the best working dog is being sought. Go-to-Ground consists of wooden liners placed in a trench dug in the ground. They are made to resemble as closely as possible natural earth where a dog might encounter fox or other prey. At the end of the course is a cage with two or three rats. The terrier is judged on how quickly it it gets to the liners and finds the rats, and on how it “worries” its quarry. The judge wants to see the Jack Russell bark, growl, dig and whine. The Racing division is probably what first attracts and most excites both terriers and owner at these trials. A sanctioned track is at least 150 feet long, and is a straight course (sometimes with jumps added) with a starting box at one end and a stack of hay bales with a hole in the middle (the finish line) at the other. A lure (usually a piece of scented fur) is attached to a piece of string that is pulled along by a generator. The dogs are muzzled for safety because of the excitement. The first dog through the hole in the haybales is the winner–and the winner, despite the impediment of the muzzle, usually has the lure clamped firmly between its teeth. The JRCTA gives out three types of Certificates for working. The Natural Hunting Certificate Below Ground in the Field, the Sporting Certificate, and the Trial Certificate. The Trial and Natural Hunting Certificate can only be awarded to a terrier by a sanctioned working judge. Although the JRTCA has not yet adopted rules covering obedience work, some trials offer obedience competitions. The individual trial officials can tell you the requirements for their events.